Verkan Vall poses as a trader to meet with Calvin, and all is a Verkan suspected – the guy knows nothing of any use. He might be giving the Hostigans the secrets of gunpower, creating paper, and organizing a military force, but he’s never going to give them the secret of the Paratime Police, that’s for sure. Since he doesn’t know anything, they might as well let him live and see what he accomplishes there, right? He tells the truth of where he’s from to Rylla, Ptosphes, and a select few others. But to everyone else, he’s just the Prince from a faraway land. Kalvan’s fame grows, and so do his enemies. but he’s a tough guy, so he’ll see it through just fine. The more time he spends in Hostigos, the less he refers to himself as Calvin Morrison, police officer, and the more he refers to himself as Lord Kalvan. This is a guy who knows he’s never going home. And there’s something very tragic in that. You know I know Kage Baker’s Company books, so of course I was going to love a story about parallel worlds and time travel. Piper isn’t breaking any molds here – Kalvan is perfect heroic “white hat”, the scheming Styphon priests are the evil “black hats”, and unfortunately Rylla is demoted to second tier character as soon as she falls in love with Kalvan, which is about a week after meeting him. Lord Kalvan of Otherwhen is the longest and last written Paratime novel. Earlier short stories and a novella were written in the 1950s, and collected in “Paratime”. My only issue with Lord Kalvan of Otherwhen was the end. The story reaches a climactic ending with Hostigos and many of the other city states going to war against Styphon. There is about 40 pages of very detailed military minutae, and frankly, I found it boring. I blame user error, because I’ve never enjoyed that kind of thing. Readers who enjoy military history, or military science fiction will find a lot to enjoy! If you’ve never read H Beam Piper, I suggest starting with his famous Little Fuzzy. However, if you see Lord Kalvan of Otherwhen at the used bookstore, it’s worth picking up. 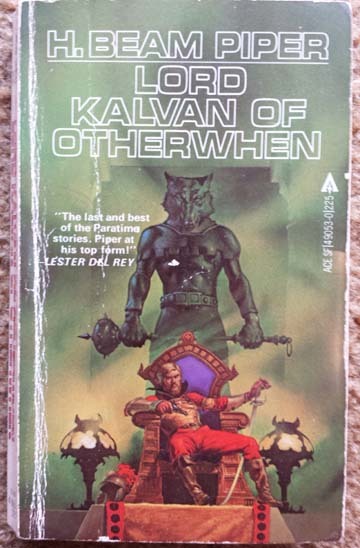 7 Responses to "Lord Kalvan of Otherwhen"
I considered doing a second vintage SF piece for you on Kalvan, but I see you ably did so anyhow! Little Fuzzy is a good suggestion, but the Paratime books are better, I think. BTW, I don’t have a lot good to say of the “updated” or remained, version of Little Fuzzy done by Scalzi. Read the original. I enjoyed the original, don’t have any plans to read the “update”. and I wish there were more Paratime stories. I read this a couple years ago, as part of the “Time Wars” anthology created by Poul Anderson and edited by Charles Waugh & Martin H. Greenberg. It was good stuff, also introduced me to Anderson’s Time Patrol stories, plus a couple other authors I keep an eye out for whenever I hit the used bookstores…..Sooner or later I’m going to read/review the whole Paratime cycle…..
Whoa! I take that back. On checking again, it seems what I read was a shorter version logging in at about 45 pages entitled “Gunpowder God.” It’s apparently the first half of the novel….. I really enjoyed Lord Kalvan. 😀 It’s not the deepest book, as you point out, but it stands head and shoulders over the other similar titles I’ve read (Jerry Pournelle’s Janissaries, etc). I don’t think it hurts that I’m the target audience for the military history talk!